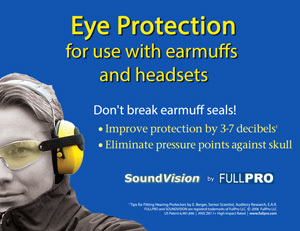 SoundVision is an innovative and patented new product that is not available from other manufacturers. Our wholesale pricing yields markups of ~100% (margins of ~50%) to our dealers. If you would like to learn more, please call 630-328-2825 or email erik(at)fullpro.com. We developed the materials listed below to support retail sales of SoundVision. Click on any of the thumbnail images to see a larger version of the photo.